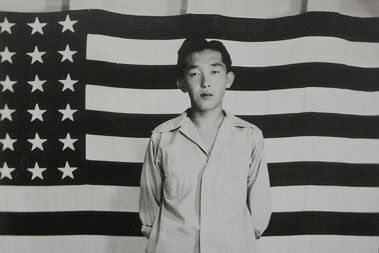 This image of a Japanese-American internee in front of a U.S. flag was taken by an uncredited photographer. 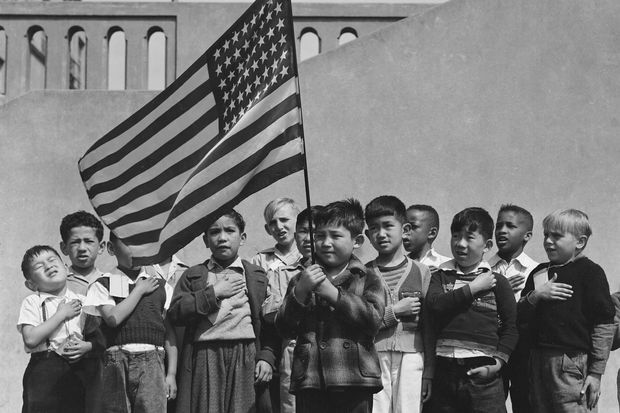 LINCOLN PARK — The Alphawood Gallery revisits the Japanese-American internment of World War II as a lesson for today in the new exhibit "Then They Came for Me." Opening Thursday at the gallery, 2401 N. Halsted St., the Alphawood's first original exhibit makes the persistent point that the "dark history" of concentration camps for minority groups happened here and could happen again if citizens aren't vigilant and active. It draws heavily on photographs taken by renowned photographers Dorothea Lange and Ansel Adams. They were hired by the War Relocation Authority after President Franklin Roosevelt signed an executive order in February 1942, following the attack on Pearl Harbor, to place Japanese-Americans on the West Coast in internment camps over fears of collaboration with Japan in World War II. The photographs were meant to show that the Japanese-American citizens were being treated well, not like those in concentration camps in Nazi Germany. But the photographers' sympathy for their subjects is clear, delivering the injustice anew today. "It's sparking conversation," Mark Kelly, commissioner of the city Department of Cultural Affairs and Special Events, said at a media preview Wednesday night. "It's reminding us of our complex history." "At this moment in our history [it] is a very important story to tell," Alphawood Foundation Executive Director James McDonough said. A persistent message of the exhibit is that intolerance, fear and hysteria can have the same effect today. It includes a work by street artist Plastic Jesus called "Donald Trump Internment Sign" that he's placed on sites proclaiming "Lot Reserved For: Future Internment Camp," signed with a facsimile of President Donald Trump's signature. Trump, of course, has imposed a ban on travel from some Muslim nations, triggering responses such as a unity meeting between Muslim- and Japanese-Americans at the Midwest Buddhist Temple after Trump's election, on Pearl Harbor Day last year. McDonough said the gallery came up with the concept for the exhibit only in February, around the 75th anniversary of the executive order. It was put together with contributions from the Japanese American Service Committee, which lent art to the exhibit including suitcases used in the internment, diaries, historical materials and documents. Committee Chief Executive Officer Michael Takada called it "timely" and "mind-blowing." He was joined Wednesday by Roy Wesley, who spoke of spending the first years of his life in an Idaho camp after he was born in Portland, Ore., in May 1942 and "immediately became a suspect alien." Rebecca Ozaki spoke of her family's internment, calling it the "dark history of the generations before me" and adding, "Never let it happen again, because it is happening right now." Speaking on behalf of Mayor Rahm Emanuel at Wednesday's event, Human Relations Commissioner Mona Noriega said one in five Japanese-Americans interned during the war wound up settling in Chicago afterward. She said the exhibit represented "America's promise to defend its pluralism." The exhibit holds its formal opening at 6 p.m. Thursday, with state Rep. Will Guzzardi (D-Chicago) expected to attend and speak on the issues at hand. The exhibit will run through Nov. 19. It includes a "Take Action Room" giving details on how citizens should "Know Your Rights," and what they can do to protect them. McDonough said the Alphawood is out to be not just an art gallery, but "we want to be activists." The gallery debuted last year with the traveling exhibit "Art AIDS America." Kelly cheered the gallery for providing a new cultural institution in Lincoln Park, along with DePaul University's new Holtschneider Center for Music and Performance under construction kitty corner from the Alphawood. "We're going to declare this a new cultural district for Chicago, and we want to thank Alphawood for leading the way," Kelly said. The exhibit gets its title from a quotation from German Martin Niemoller: "First they came for the socialists, and I did not speak out — because I was not a socialist. Then they came for the trade unionists, and I did not speak out — because I was not a trade unionist. Then they came for the Jews, and I did not speak out — because I was not a Jew. Then they came for me — and there was no one left to speak for me."